You can find a copy of Monopoly tailored to almost any interest, hobby, or pop culture property. The most popular board game in the world has been endlessly licensed, but this magnificent Transformers version from Winning Solutions raises the bar all the way to Cybertron. 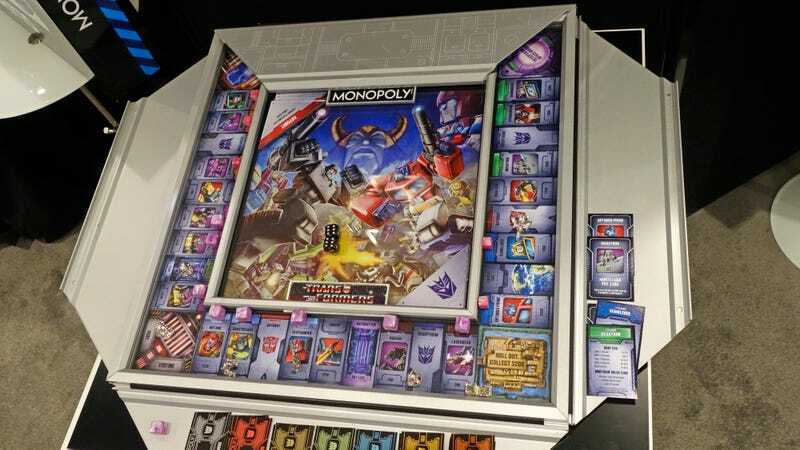 Featuring original artwork inspired by the packaging of the ‘80s toy line, Transformers Monopoly replaces all of the game’s classic properties with Transformers characters. Where you’d normally find Park Place and Boardwalk, you’ll instead find Bumblebee and Optimus Prime as the game’s most valuable spots to buy up on the board. And players don’t Pass Go to collect $200, they instead “Roll Out.” Perfect. Monopoly’s traditional houses and hotels are also gone in this version of the game. Players collect money to buy energon cubes instead which powers up the characters they’ve purchased to increase the ‘rent’ when other players land there. Even the game’s money will have you wishing the US Mint created a similar design for the country’s official currency, with Autobot and Decepticon logos featured on each bill. What really steals the show, though, are the game’s tokens. Hasbro recently reached out to the internet to help vote and decide what all the new tokens for the classic version of the game will look like. But had the options included Optimus Prime, Grimlock, Rodimus Prime, and the Allspark, which all come bundled with Transformers Monopoly, they would have easily swept the voting. The game is a work of art, so Winning Solutions has designed the game board so that collectors can actually hang it on a wall if they want. Hinged aluminum panels surrounding the board can be folded in (or transformed) to cover everything except the Transformers artwork in the center. Is it a little over-the-top? Without a doubt. But when the game is finally available sometime around July 1 later this year, it’s going to come with a price tag somewhere around $500-$600, so the last thing you’d want to do is shove it back into a closet when you’re done playing.